New to Locus. Just bought the app a week ago and already have a need to tweak a setting. How can I define a radius of the "Show Rings" setting? I would like to set the radius to 40 meters, so I can see if I am within a specific range of a waypoint. I'm using the app to both plot trails in a park and plan missions for the game Ingress. Knowing if I am within 40 meters of a waypoint would greatly increase the ease of planning things. distance rings parameters are hardcoded in application, so there is no chance to modify them. 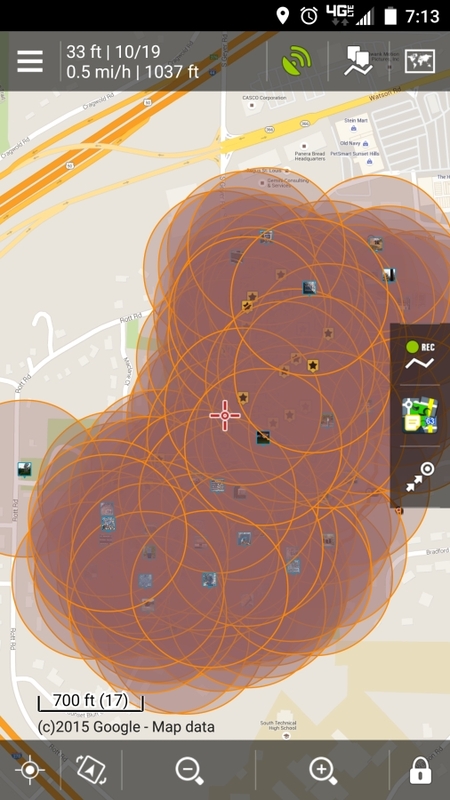 Only think I can imagine that should help here, is using POI Alert feature, where you may define radius 40 metres and Locus will then notify everytime, you get closer then defined distance. for planning it would be helpful to create circles with "Geocaching tools" in Menu/ More/Geocaching with own diameter around waypoints. The alerts would not help as planning is not being done at the location. it is being done offline. I tried the Geocache Tools suggestion, Every way point in the park now has circles. As you can see they are too large. 161 meters. Getting closer to what I need. are these possibly able to be changed? If not, would it be possible to add a transparent image with a predefined radius over a way point, that would show both the icon (that has photo icons) and the radius overlay? Oh, you used the wrong tool! The first tool with circles is what you are looking for! With radius, color and center to define. Thank you. Exactly what I needed. I can even set it to Meters!